This New York Magazine feature is fun, especially in slideshow mode. While the skirts are too short for me, I was impressed by the wearability of the pieces, priced from $30 to $1000. This summer I noticed the ubiquity of neutrals. Could be the sign of a lingering recession, but I think women are buying for longevity, whether at Old Navy or Chanel. 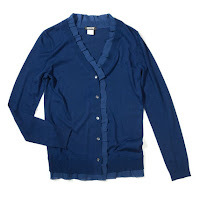 Shown above, sapphire cashmere cardigan with georgette ruffle trim. DKNY, $195. The autumn "must have" according to many is the camel boy-coat, which is at least a classic, unlike the weird open-toed boots of last spring. However, my mother wore this coat (actually several identical models) for at least 30 years, and I'm not able to even try one on. I love how Camel looks on others but it completely washes me out...I bought a black wool last season minimal detail from Olsen, a European line...and I love it. I hope to get many years of wear out of it...I too am looking to the future when I purchase new garments. It could be that I am of that certain age...and padding my RRSP's! I love camel, but it needs a lot of dry cleaning, especially if you live in a city. I think a lot of people realize--the horror, the horror--that they have too much stuff. I'm going to see how long I can go without buying something new. It's not a "no-buy-pact" or anything--just a recognition. Oops--second part of my comment was in response to YOUR comment about basics. I think people either have or will buy nice basics--at all price points. I love camel on others but not on me. In a camel coat mixed with the grays of winter I look like the slush on the side of the highways; not a look I am going for. But I understand about buying personal neutrals even as I think that justifying a purchase because it will "last forever" is buying into a myth. The slideshow was cool though, and made me think and reassess a bit. Like your other commenters, camel doesn't really work for me. I've got a charcoal cashmere (100%, really, got it at BR -- their "Heritage" line -- on sale two or three winters ago) "boy coat" that I love wearing for a "smart" look, and won't be swapping it out for camel . . .
Just a note to thank you for your wonderful blog. I discovered it a few weeks ago and have been enjoying your writing very much. You have such an appealing, thoughtful perspective. And to say that I love the camel boy-coat, which reminds me of my winter coat in early elementary school. In those days we wore crinolines and their fulness did not go well with the lines of the boy-coats but my sisters and I wore them together anyway! I haven't worn camel in donkey's ages but I seem to remember it worked OK. My mother had/has a thing for capes. I won't be wearing those:). Rubi: Where did you find purple melton? hostess: I'm the black wool type, too. Frugal: So true and so 'you' to point that cost factor. (Absolute worst is a white coat.) Re your non-pact, hope you'll keep going to Goodwill b/c you have amazing stories. Mardel: I can imagine from your photos, you would look half dead. Francie: Finally a commenter who can wear camel! And welcome! LPC: Capes, oh god... shall I post on them or will you? I'm thrilled to see camel back in style. But, anything double breasted is not going to make it into my closet. I find that anyone with less than a supermodels figure, looks paunchy in double breasted blazers and coats. I can't wear camel either though my teenagers have been steering (forcing) me towards grey and navy rather than my usual black/white/red. I have however only bought small items to supplement what I have rather than major ones. The purple melton's from Calvin Klein -- it's what a friend of mine calls "pet me" fabric. Very scrummy. I love camel and have been getting plenty of wear out of a new(ish) camelhair jacket ... I did enjoy looking at some of those NY mag pieces. Do we need 110 staples? Seems a lot of clothes! Camel works for some, but a coat in a neutral that works for you can be a piece that is kept for years. Camel hair is a beautiful fabric, but I confess I don't like its natural colour with my complexion. Whom exactly does it suit? I love black woollen coats too, though my favourite in recent memory remains my charcoal-grey loden coat -alas the moths got to it. I'm also fond of red coats - whether a true but rather deep red or a more maroon or burgundy. Yes, that is far too much in the way of staples. Why are all the skirts so short? Their readers aren't all 20-somethings, and NYC isn't exactly tropical. Belle: Single breasted is enough! Alienne: Grey is everywhere here but I always look for a rich grey, toward charcoal, as some grays are so sad. Rubi: Calvin K, have been doing very good work recently, lucky you! Tiffany: Real camelhair fabric is incredibly durable and so luxurious. Imogen: Think it's intended as a selection but years ago I took 110 to heart. lagatta; I've seen camel glow on those with peach undertoned skin, and some camels are far yellower than others; some camels actually have a pink undertone, close to flesh. Yeah, short skirts! Not for me either and just try to find longer in NYC boutiques. Welcome back Duchesse! I trust that activities during your hiatus left you rested and refreshed. As to the camel polo coats, I always feel bad when a true "classic" runs into trendy. Somehow for me it spoils the cache that these items always exude. I once saw a great photo of the Kennedy siblings (on the lawn at HyannisPort of course, tossing around a football) wearing the required rugby shirts, corduroy trousers and ivy league scarfs. But what I loved most was the fabulous camelhair polo coat on one of the girls. Big pockets, wide lapels, mother of pearl buttons...the full monty. They were a rakish lot, but certainly had style. The shot was taken in the early 50's, long before these simple items became a trend that walked down every runway. Whether it flatters you or not, I find camel and the right shade of grey to be luxe looks that never truly go out of style. maggie: They were exemplars of that classic luxury. I am amused to see what was called dowdy a year or two ago is now a "must". Oh dear, do you think they will glom on to my beloved duffle coat next?